BELMAL, originally based in Brussels,and now in the south of Belgium, hosts a museum type of collection of antique and vintage travelling trunks, as well as a restoration workshop for ancient travel equipment, and also the manufacture of brand-new Belmal Malletier trunks. The BELMAL name stems from Belles Malles (French for beautiful travel trunks), and for Belges et Malles as well as Belgen en Malen (meaning Belgians and travel trunks, in Dutch and French). The collection features a number of luggage items that have a remarkable or unique history. The heritage section also includes other objects and tools from trunk-makers of Europe and other parts of the world. Another set of items, consisting of, for instance, chests, bags, packing cases, and certain fine leather goods, are part of the BelMal Archive, plus the historical documentation. The idea of creating a historical museum-collection sparked when Jean-Pierre Bal, the founder of BelMal, discovered a 19th century trunk that belonged to George Lansing Raymond, a renowned professor of aesthetics at Princeton University. He toured Europe in 1890-1891. The 'Raymond' trunk was found more than a century later, in 2007, in Belgium. While the museum project unveiled, it also became a first in Europe as it integrated specialised institute courses in the history of travel equipment and manufacturing techniques; the restoration activity and practical workshops; the registry of worldwide and Belgian trunk-makers and brands; the research activity, and the manufacture of new trunks. In 2018 Monsieur Bal made yet another giant leap forward, by means of his Ecole des Malletiers Gilbert and Jean Paré. The passion for beautiful travel luggage of BelMal's founder is for example, fuelled by the presence of a Louis Vuitton trunk of the 1880s. Since 1967 it had its very own space in the house where Mr. Bal spent the first twenty years of his life. Nowadays the lovely brown leather 'LV' trunk mixes in with other 'great travelling trunks' of the museum collection. BelMal offers conservation and restoring services that range from minor repairs to major renovation of antique trunks and some vintage luggage. In general the trunks are from the 18th to the 20th century (approx. 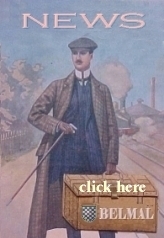 1750 to 1930), including wardrobe and cabin trunks used for travelling by steamship or train. Other types of luggage, such as hat trunks or boxes, portmanteaus, large bags, plate packing cases, car trunks, and early-type of suitcases (valises,...) are also being restored for the BelMal collection, or for third parties. All activities take place under the aegis of a not-for-profit organisation that focuses on education and historical heritage. In the BelMal Collection there is a specialist focus on Belgian trunk makers of the past centuries. The Belgium Section features trunks manufactured by companies such as Carlier, Coessens, Delsart, Delvaux, Denonne, Janssens Vanderkelen, Jockin, Laust, Michel, Olyslager, Piret, Taymans, Truyen-Bertou, and Ange Faucq malletier brands. There is also an extensive and ongoing research about, on the one hand, the chest-makers (coffretiers) which in the 15th century formed the Brussels' guild and also of other cities in Belgium (mainly Brughes and Antwerp), and, on the other hand, about technical areas in the malletier artisan profession past and present. The brands and malletier-names of the trunks in the International Section of the Collection include, for instance, Oshkosh, Friedrich, Delhopital, Griffith, Rascher, Aux Etats Unis, Duval, Barnum, Vuiton, Gulliver, Folding Trunk Company, Grands Magasins du Louvre, Hamilton's, William Bal, Goyard, Old England, Au Printemps, Hartmann, Moritz Maedler, Belber, Hammel, Moynat, Victor, Palica, Hawley's, Grand Bazar de Paris, Shwayder, and many other. Novelties are also found through the Ecole des Malletiers Path II course-ateliers where new trunks are designed and manufactured entirely by hand, in the Belgian atelier formerly of Belmal Malletier. The bespoke trunks for travel are made only on commission, while unique artwork ones are usually seen only at special presentations for collectors. For further references about the craftsmanship, TV tributes, movie and prizes,... see founder's profile page.